You find yourself in an alien, perplexing world. You don’t really know why you are here or what it is you are supposed to be doing. There is a large area to explore -- though eventually you can go no further unless you can unlock a door that has no key. You take a closer look at the environment and begin to see patterns, clues. You find a letter with a vaguely alarming message. Suddenly, you see the pattern a different way. Ahhh! That's how the power operates! There is a grinding noise, and a door opens, leading to a place that is not at all what you expected…. This is Uru. Okay, this could also be a description of Myst; in many ways Uru continues Myst’s traditions. But it is also something completely different. In Uru (I will be describing the stand-alone game only, without the online Uru Live component), the adventure begins in the American southwest. You are initially assisted by a character named Zandi who sits in the shade of his trailer home, patiently answering questions. There’s also a message from Yeesha, who is a descendent of the D’ni. The D’ni are a race who have lived secretly for centuries in caverns beneath the earth. Yeesha offers a quest that cannot be refused; a journey whose purpose and dangers are hidden. The story weaving its way through Uru resonates with history from the Myst games and books. You receive periodic explanations from Yeesha as she fills in the background to the journey/quest. Further, you stumble across journals that provide glimpses into the minds of the archaeologists and researchers who are also exploring the various D’ni Ages. These scientists are members of the D’ni Restoration Council (DRC), and their methods are very different from those of Yeesha. The DRC is proceeding cautiously, carefully following rules and procedures. Yeesha, on the other hand, is past the stage of following other people’s rules. She acts from the heart, with insight and passion. Uru sows the seeds of this looming conflict, but leaves it unresolved. Overall, I would have liked the story to be a bit more fleshed-out -- I'm assuming the plotline develops further in the online Uru Live portion of the game. There are five ages to explore in Uru, plus glimpses of the mysterious city beneath the earth. There’s an introductory age that accustoms the player to Uru’s controls and style of gameplay. The game can be played with either the mouse or the keyboard, and you choose to explore from either the first person or third person perspective. I liked this flexibility a lot. Third person lends itself to positioning your avatar with precision. First person gives a closer, more intimate view of the surroundings. The four major Ages in Uru are considerably larger than the introductory Age. You link to these from your personal age -– Relto -- where you keep a collection of linking books. Relto also allows you to change the appearance of your avatar whenever you like. In the four major Ages you will encounter giant organic structures, ravishingly beautiful landscapes, dark passages, ancient technological marvels, secret chambers, huge engines, hidden staircases, sumptuous gardens, and paths that wind impossibly high with nothing but mist below. Where Uru truly shines and delights is in the immersive quality of these worlds. The Ages in Uru are gorgeous. From every angle the place is breathtaking. In 3D, the worlds come alive in ways they didn’t in the 2D Myst world. Everything that moves in the game is glorious to watch – rippling water, swirling clouds, the pattern of light and shadow as you stand on a moving platform, fish moving through the water, “snow” falling. Ambient sounds in Uru are amazingly realistic. The New Age music is beautiful and appropriate in each Age. One place in particular – the shrine on D’ni – features a single clear voice rising above the cadence of a drum. It is both spiritual and alluring. I thought the music in this game suited it perfectly. Some of the challenges in Uru would fit comfortably into any previous Myst game. These include mechanical puzzles and pattern puzzles. A few are simple if you observe your surroundings with care. Others are multi-stepped and tough. In the toughest puzzles, I could identify the salient clue(s) and get a sense of where the puzzle was leading, but had difficulty making the final connection to the solution. I thought Uru’s hardest puzzles were more difficult than those in the previous Myst games. Many of the challenges in Uru incorporate movement. A few are actually observation challenges: what happens when you (or objects in the environment) move? These challenges are a lot of fun. In fact, they are ingenious. However, there are physical challenges in the game that require timing and skill and these are more difficult. Uru took me about sixty hours to complete; I estimate that I spent five of those hours jumping. To be more accurate, I spent five hours jumping, falling and then waiting for the Age to reload after I’d missed the landings. I spent the longest time on a series of jumps that could have been avoided altogether if I had explored a bit more before charging ahead. Of the challenges that are necessary to progress, it took me about twenty attempts to beat the hardest jump. For the most part I enjoyed jumping, though I never did feel completely comfortable doing it. Still, I was an expert jumper when compared to the total incompetence I demonstrated while pushing things. The places in the game where you have to push things were frustrating in the extreme; not only because the process itself is awkward, but also because many pushable objects are NOT part of puzzle solutions. I spent a long time trying to push packing foam onto an elevator without success. More time trying to push a bone into a hole without success. Even more time trying to push a cone through a gap in the rocks without success. All these futile endeavors turned out to have absolutely no relevance to the game. I know there are Myst aficionados who will be wondering if the 3D graphics in Uru rival the 2D graphics in Riven. Uru has more realistic water effects, and does a much better job with wind, clouds, mist and drifting leaves. You can stand in the rain, watch the sun set and see the stars come out. Uru’s underground environments are more weighty and monumental and the air is full of dust. Critters are more fun to watch in Uru because they approach you, even buzz around you. Animations are integrated into the environment much more seamlessly. Riven, on the other hand, has more realistic sunlight effects, and does a much better job with reflective surfaces, subtly blended shapes, mottled effects, and gradations in shadows. Uru is more kinesthetic, more of a balanced experience. Uru flows. You always know where your body is in space. Riven is intensely visual, with objects and vistas honed to photorealistic perfection, but Riven can give the player a surprising experience of disorientation and jerkiness with the simple act of turning around. Is Uru a genuine sequel to Myst? Well, there are things about Uru that are so entirely new that it feels more like an off-shoot than a sequel. 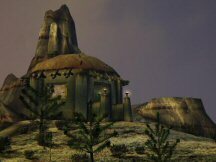 It’s as though Myst had the potential to split in two paths. One is detail-intensive, intricately beautiful and contemplative. The other is experimental, spectacularly beautiful and full of movement. Uru embodies the second path. Since finishing the game, I’ve been re-exploring the worlds, noticing some of the little things I missed the first time around. The game is fascinating, visually and auditorially entrancing, occasionally bewildering, absorbing, mysterious and deep. I like it so much that I can’t wait to see what lies ahead on this particular path! Jaw-dropping, haunting 3D environments. Ability to switch between 1st person and 3rd person perspectives and to customize your avatar. The game autosaves and gives you access to one in-game save point in each Age. No sliding tile puzzles, no sound puzzles, no mazes, three fairly forgiving timed puzzles, a handful of difficult jumping challenges and logic puzzles. Mechanical puzzles, pattern puzzles, exploration and observation. You cannot die, but if you fall, you link back to your “home” Age (Relto) and must re-link to where you were playing. Load times are long. Two minor glitches in which the avatar sank through a solid surface and then linked back to Relto. The game was stable, except when the graphics settings were cranked up to maximum. The quality of the graphics at the lowest settings when compared to the highest settings was so different that it almost seemed like a different game. Terrific music and voice acting. Not a lot of story, though what’s there is intriguing. Game length: long. Aimed at gamers who like to explore gorgeous, surreal environments while solving a wide range of puzzle and movement challenges. Reviewer’s system specs: Windows XP, Pentium 4 1.8 GHz with 512 MB Ram, a 64MB Geforce 3 video card, Direct X 8.1, and a Sound Blaster Live sound card. Graphics settings: Overall quality and texture -- High; Anti-aliasing -- Medium; 32 bit color depth; 1024x768 screen resolution.